"People are afraid of the earth-changing events and ripple effects of the earthquake, which led to tsunamis, the nuclear meltdown, and which will lead to radiation and health concerns," said Vivos CEO Robert Vicino. "Where it ends, I don't know. Does it lead to economic collapse? A true economic collapse would lead to anarchy, which could lead to 90% of the population being killed off." The last time people flocked to purchase bunkers in such droves was right before the Y2K scare, according to Stephen O'Leary, an associate professor at University of Southern California and an expert on apocalyptic thinking. "Tens of millions of people believe in a literal apocalypse, which involves earthquakes, storms, disasters of global proportions and especially disasters related to the Middle East," O'Leary said. But, he added, "Some believe that this is just a turbulent time and they have to go somewhere to ride it out." Elan Yadan, a clothing store owner in Los Angeles, is one of the many customers who rushed to find a bunker last week. Yadan secured a spot for his family in a Vivos' shelter, putting down four deposits totaling $20,000 -- $20,000 that had been earmarked for a down payment on a new house. "I honestly didn't want to do it, but unfortunately it looks like the worst expectations about the world are starting to come true," said Yadan, who had been reading about Mayan predictions of a global meltdown in 2012. "With the things happening this week, it's better to be safe than sorry. And what good is a house if you don't feel safe?" Yadan will be riding out any apocalypse in Vivos' most ambitious project to date. The company has more than five 200-person shelters in the U.S. that are in various stages of construction, but this facility outshines them all. 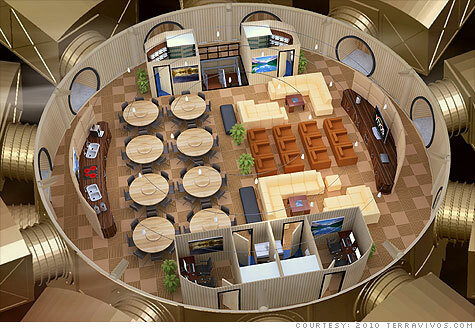 The bunker, which is being built under the grasslands of Nebraska, is 137,000 square feet -- bigger than a Wal-Mart -- can house 950 people for up to one year, and can withstand a 50 megaton blast. Once completed, it will boast four levels of individual suites, a medical and dental center, kitchens, bakery, prayer room, computer area, pool tables, pet kennels, a fully stocked wine cellar and a detention center to place anyone who turns violent. Plus, there will be a fortified 350-foot lookout tower for residents who want to see what's happening in the outside world. That's what Yadan intends to do. "I'm not a psychic but I'm not a scientist either, so I'd rather err on the side of caution -- and I'd rather survive and live in a bunker for a year than be wiped out," he said. Japan's crisis hangs over U.S.